Naming your business in a "not-com" world - Sewelltech, Inc.
Benefits of New Top-Level Domains. For two decades, the Internet has known just 22 top-level domain names (TLDs). You know them as the last part of Internet addresses, for instance, .com, .net or .org. Beginning in 2012, the Internet Corporation of Assigned Names and Numbers (ICANN), the regulatory body for domain names opened up applications so that any organization (or individual with $185K to cover the fee) could get their own TLD and a bigger piece of the Internet. 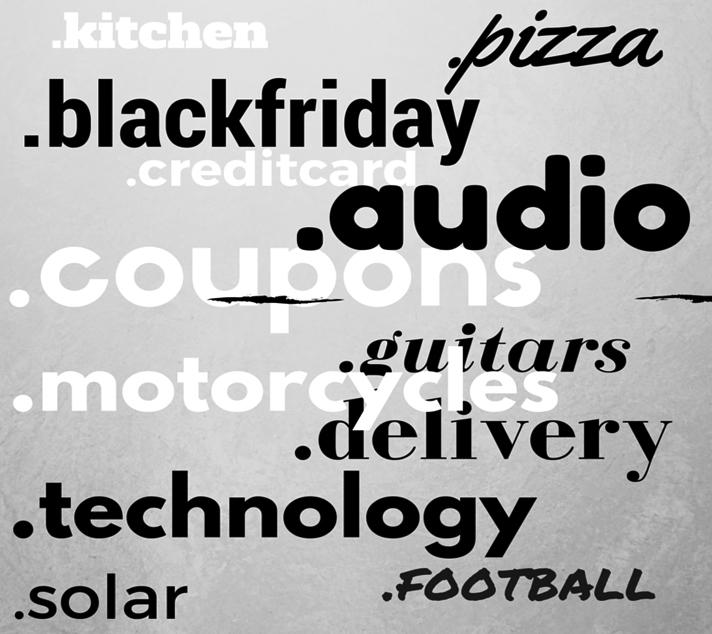 .audio, .blackfriday and .pizza are just three of hundreds of examples. Prior to the changes there were 22 gTLD suffixes in use on the web with varying degrees of adoption. Those gTLDs range from the heavily used .COM, .ORG, .GOV and .EDU, and the less frequently used .MIL, .NET, and .BIZ, to the near obscure .TEL, .INT, .INFO, .ARPA, .AERO, .COOP, .NAME, .PRO, .ASIA, .CAT, .JOBS, .MOBI, .POST, .TRAVEL and .MUSEUM. In addition to these existing gTLDs there are approximately 248 two-letter ccTLDs (Country-coded Top Level Domains) associated with specific countries. In July 2010 ICANN changed .CO from a ccTLD representing Colombia to a gTLD intended to be used like .COM. Since that change ICANN has registered 1-million .CO domain names, a strong signal that the marketplace is ready for more domain name options. The changes announced by ICANN will see the number of gTLDs increase dramatically in the coming years and will allow brands, organizations, niche areas and even cities to apply for and run their own gTLD. Why are new gTLDs being introduced? Inspiration for naming your business in a “not-com” world. -There are new options. Actually, several hundred of them. Instead of being limited to .com, .net or .org, entrepreneurs may be able to find suffixes—the part of a web address after the dot–that say more about what their company does. Or are simply more fun or interesting. Alphabet (Googles new parent company) appears to be going with abc.xyz. Other options include .recipes, .bike, .photo and .farm, as well as .lawyer and .media and .financial. LionsGate, the film company behind The Hunger Games undefined franchise, recently launched TheHungerGames.movie. The average domain runs between $30 and $40, but some sought-after names can be much more. Some of our more specific words, like .coffee, .clothing, .florist, .farm have a strong appeal because they fit the user’s passion or business. Some of our more generic terms, like .business, .life, .company have a broader appeal. As it stands today the SEO implications of the new gTLDs are theoretical. Nobody can say for sure what the long-term SEO implications will be and the short-term impacts won’t matter for at least another year. The most educated guess that can be made is that the new gTLDs will impact SEO the same way that the current gTLDs do, which is not much at all. It is known that ccTLDs have minor impacts for geo-specific SEO but to date whether you operate as a .COM, a .NET or a .TRAVEL is irrelevant to search placement. In theory the presence of keywords in the gTLD might offer some SEO advantage but that is only if and when algorithms change to consider the text in the suffix. At present there is no reason to assume that owning a specialized gTLD will offer any clear SEO advantage. However, well established and globally present brands may see search engines adjust to give preferential treatment to their branded gTLD using a similar mechanism to the domain age criteria already factored into algorithms. Also, shorter URLs could boost SEO by being more social media friendly and by supporting better site architectural planning. Trademark owners must now be concerned with protecting their marks not only at the second level (meaning, to the left of the dot), but also at top level (to the right of the dot). Owners will most likely need to focus the majority of their efforts on protecting their brands at the second level.